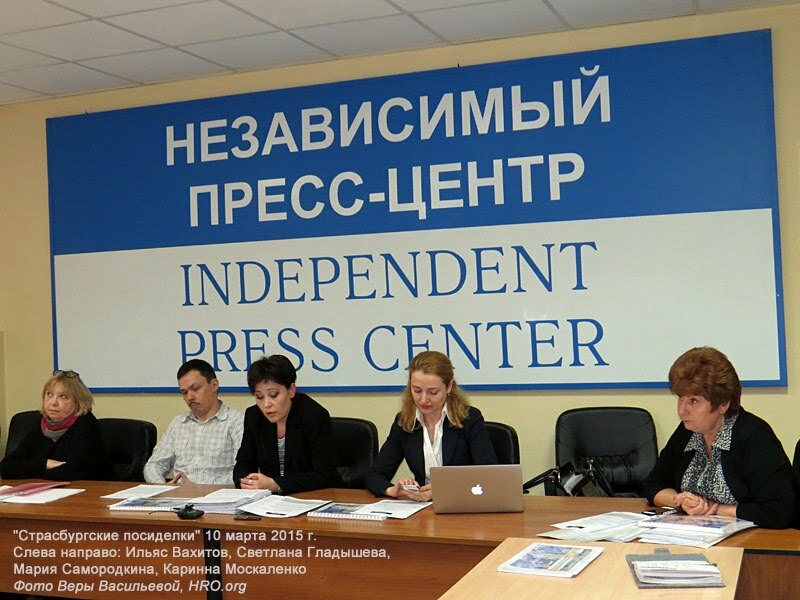 On 10 March 2015 at the Independent Press Centre in Moscow the latest in a regular series of round table discussions entitled ‘Strasbourg Get-Togethers’ was held. This was a joint event by the International Protection Centre and the Centre for the Protection of Housing Rights. Issues discussed included the execution of general measures laid down in judgments of the European Court of Human Rights (ECtHR). Lawyers, applicants to the ECtHR and experts taking part in the discussion included Karinna Moskalenko, Maria Samorodkina, Elena Nakhimova, Svetlana Gladysheva and Ilyas Vakhitov. As is well-known, execution of the judgments of the European Court of Human Rights involves the adoption by states, firstly, of measures of an individual character for the purpose of removing the consequences of violations against the applicant. Secondly, execution involves introducing measures of a general nature for the purpose of preventing similar violations of the Convention in the future. And if the issue is approached from these general positions, then it must be recognized that since 1998 when Russia became a signatory of the European Convention on Human Rights and Fundamental Freedoms, our country has fully executed only a small number of rulings by the ECtHR. “In reality, we don’t in any way detract from the role of the state, but only seek to stimulate it into defending its own citizens without waiting for problems to be resolved at the international level. We apply on behalf of our state because we are helping the development of Russian law-enforcement practice and the judicial system so that the rights of each person as laid down in the Convention are protected above all at the national level. "The decisions of the European Court of Human Rights are obligatory for the Russian Federation since the European Court is as much Italian as Russian, and as much Finnish as Russian, and as Georgian as it is Russian. This is a court of all 47 states that are members of the Council of Europe, it is a common court for all member states. It was created not to punish one state or another, but to protect the rights of each and every citizen of the 47 states that are members of the single home, where there exists a single standard for the minimum protection of human rights. You cannot apply to the European Court if you have not exhausted all effective means of legal defence within a given country. And only when, in the name of the Russian Federation, a final court rules in a manner incompatible with the European Convention can the mechanism of the European Court start to work. Svetlana Gladysheva gave a specific example of the consequences of bad law and gaps in legislation. In 2005 she purchased an apartment, but four years after the acquisition officials discovered that the initial privatization of this and a number of other properties had been carried out by means of falsified documents. Those responsible for the fraud were not found, the court ruled that while the new owner of the apartment had acquired it in good faith, nonetheless the property should be returned to public ownership and the owner should be evicted without compensation or offer of other accommodation. In 2012 году the European Court ruled in the case of Svetlana Gladysheva that those who buy apartments and other property that was at one time in public ownership cannot be held to answer for the legality of the procedures by which they were initially privatized and subsequently resold. "As a formal basis for the seizure of apartments from citizens and their eviction into the streets, government agencies rely on the fact that formerly these apartments had been stolen from government property. At the same time it is recognized in practice that the citizens whose apartments are confiscated have no relation to the theft. Property is being taken away without any compensation from completely innocent people,” Svetlana Gladysheva said. Ilyas Vakhitov also pointed out that in the great majority of cases apartments are confiscated from people who have purchased them in good faith. A lawyer with the International Protection Centre, Maria Samorodkina, agrees with her. She gave as an example the case of Stolyarova v Russia. On 29 January 2015 the European Court of Human Rights issued a judgment which held that there had been violations of Protocol No. 1 (‘protection of property’) to the Convention on Human Rights and Fundamental Freedoms and of Article 8 (‘right to respect of private and family life’) of the Convention. The European Court of Human Rights concluded that the apartment the applicant had acquired had been privatized by means of fraud, but ruled that government agencies should have established that this fraud had taken place. And that the applicant was a purchaser in good faith since she could not and need not have known about the existence of these problems.